I continued with my ambitious back-garden to-do list over the weekend. 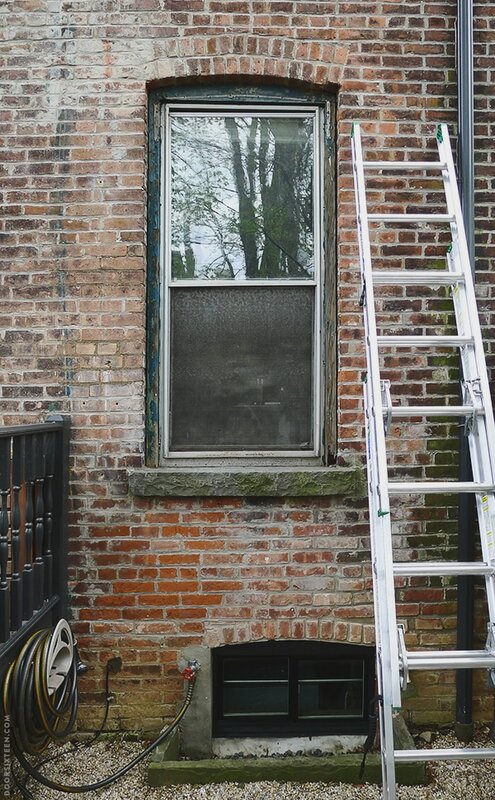 The last project I tackled was painting the vinyl basement window, and now I’ve moved on to the much more complex, fun, and slightly overwhelming task of repairing and restoring the original wood sash window above it. Window repair is something I’ve talked about before when I showed off the guest bedroom window and the work I did with the three in the living room, but this multi-part project is going to be a little bit different as it concerns the outside of the house. While all but four of our windows look pretty good from the inside at this point, NONE of the windows (or their casings) have been touched on the outside—and they’re all in pretty rough shape. In an ideal restoration situation, a window and its components would be repaired on all sides at the same time. Because our house is in an historic district, any alterations made to the exterior of the house need to be approved in advance by the Architectural Review Commission. We couldn’t afford to take on the major exterior renovation work our house needed (like repointing the brick, repairing the cornice, and rebuilding the porch roof) when we first became homeowners, so it didn’t make sense to go through the approval process (and pay the $100 fee) just to be able to paint the windows. Also, time is always as much of an issue as money, and with only two days a week to devote to fixing stuff, we’ve tended to make the inside more of a priority than the outside. Anyway, back to the window repair! The first thing I did was take care of the aluminum storm window. As much as I would LOVE to ditch them and bask in the beauty of exposed sash windows, the reality is that we need them. Our house has 125-year-old single-pane windows and no insulation, and we get a lot of precipitation in the Northeast. For the sake of our comfort, our wallets, and the health of our windows, we need them to be protected. 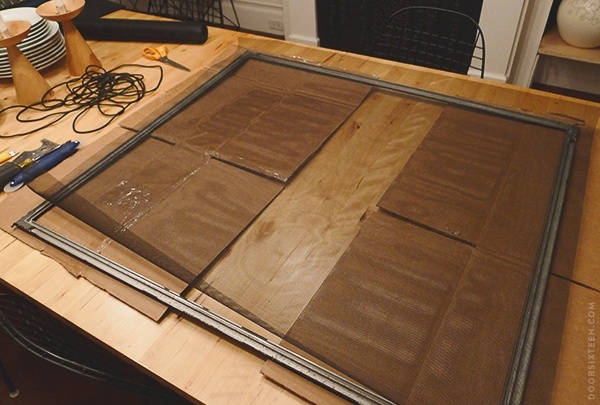 I would LOVE to have custom hanging-style wood storm windows made (like the ones from SpencerWorks…so nice), but that’s beyond our tiny budget, so I gotta make the aluminum ones work for now. Not so pretty! 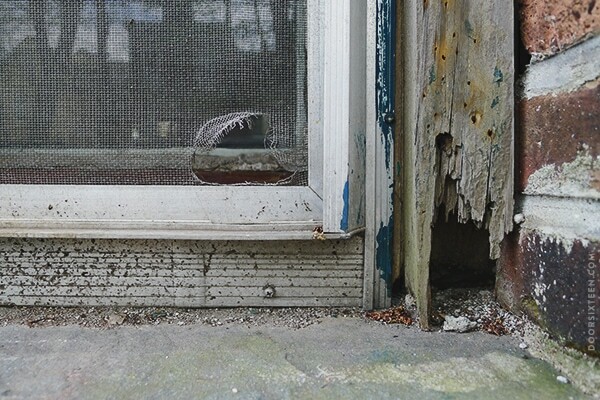 The worst thing about bare aluminum storm windows is, well, the aluminum. It’s prone to pitting and oxidation, and even on its best day it looks drab. Time for paint! Assuming the aluminum doesn’t have any kind of coating on it and the finish isn’t high gloss, it’s very easy to paint. You do need to clean it well, though. I don’t like to use steel wool on aluminum because of the risk of galvanic corrosion (yes, I had to look that up), so I cleaned all of the parts of the storm window first with a Scotch-Brite scouring pad and dish detergent/water, and then again with TSP substitute. I left everything in the sun until it was completely dry, then got my tarp set up. Not the most exciting set of before and after pictures, but the difference in person is pretty remarkable. I used my old favorite Rust-Oleum Rust Reformer spray paint (aluminum doesn’t rust, of course, I just love the finish of this spray paint when I need a durable, matte black surface), and the aluminum took it beautifully. I should note that I only painted the exterior side of the frame and the bottom the inside—I didn’t want to paint inside of the tracks themselves since that’s a high-friction area. You don’t have to use spray paint, by the way! You can use the same exterior paint that’s on the rest of your house. I’d suggest using a good spray primer to make life easier, then apply your finish paint with a small foam roller. I also gave the screen inserts a full makeover! 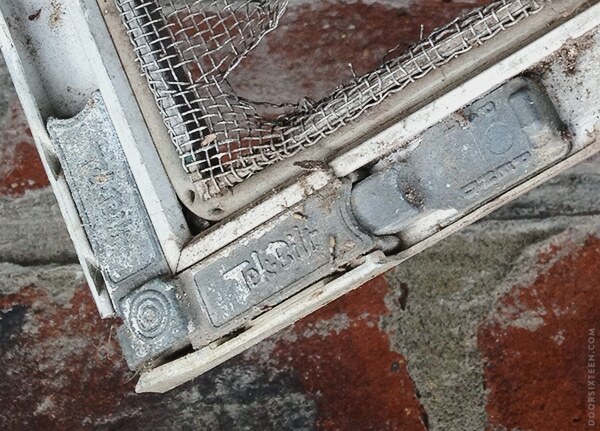 I did a little research into the Tek-Bilt brand, and as far as I can conclude, our storm windows are about 60 years old. Kind of crazy, right? I think of them as being new and ugly because they’re newer than the house, but no, they’re old and ugly (still half the age of the windows they’re protecting, though!). Aside from the holes, the metal screening has gotten pretty oxidized, which looks crappy from the outside and obstructs the view from inside. Supplies! Here’s what you need: Scissors (not pictured), spline, a spline roller, a flat-head screwdriver, a utility knife, and a 5-in-1 tool (totally optional, I just like to have mine handy for most projects). Oh! And screening, of course! I went with charcoal fiberglass screening, which is nearly invisible—and very affordable. If I had buckets of cash lying around I’d go with bronze screening, but you can’t have everything. Charcoal fiberglass is just fine for me. Do a rough cut of your screening, leaving about 1.5–2″ of overhang on all sides. 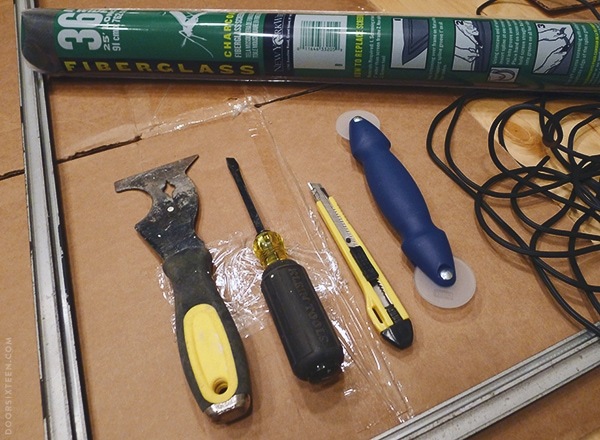 Fiberglass is easy to cut with just scissors, it’s like cutting cloth. You don’t need it to be perfect, so there’s no need to use a straight edge or anything like that. Use the convex side of the spline roller to press the screening into the channel on the frame, then use the concave side to roll in the spline. When you get to the corner, use your screwdriver to make the turn. I found it easiest to do one side at at time: Press, roll, turn. Repeat! 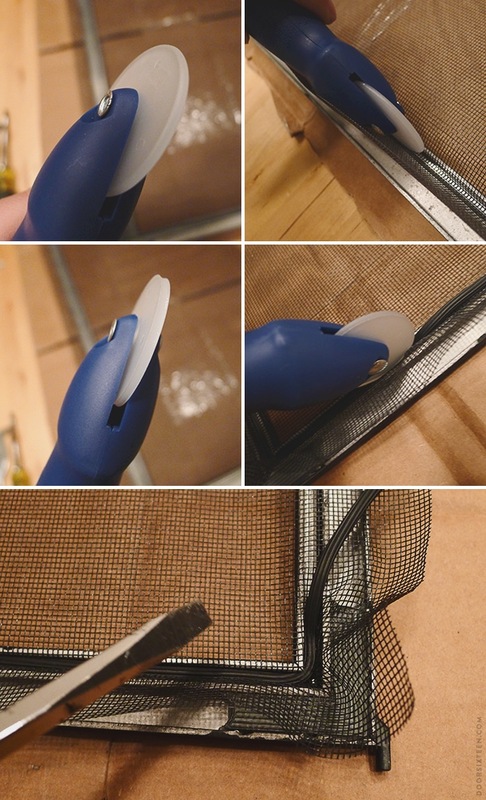 When you’re all done and the screening feels nice and snug, trim off the excess with your utility knife. It did take some finessing and re-doing a couple of times to get the screen to fit smoothly and snugly, but it’s not rocket science. This was the first time I’ve rescreened a whole window, and I didn’t find it difficult. Next time, it’ll go even faster! Here’s a terrible picture of the end result! I can’t show you what it looks like on the house yet because I still have several weekends’ worth of work left on the window itself before I can reinstall it, but you get the idea. It’s going to be a HUGE improvement, from both inside and outside the house. Next up…sash window repair and painting!! Yayyy! 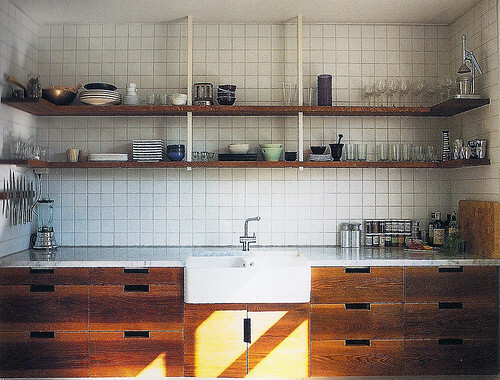 Thinking about a new kitchen. Yes, the appearance (or lack thereof!) as well as the longevity. It’s not something I’d seriously consider putting in these old storm windows, though! Maybe in the future if we have nice wooden screens made for the front of the house. See now I have no excuse! 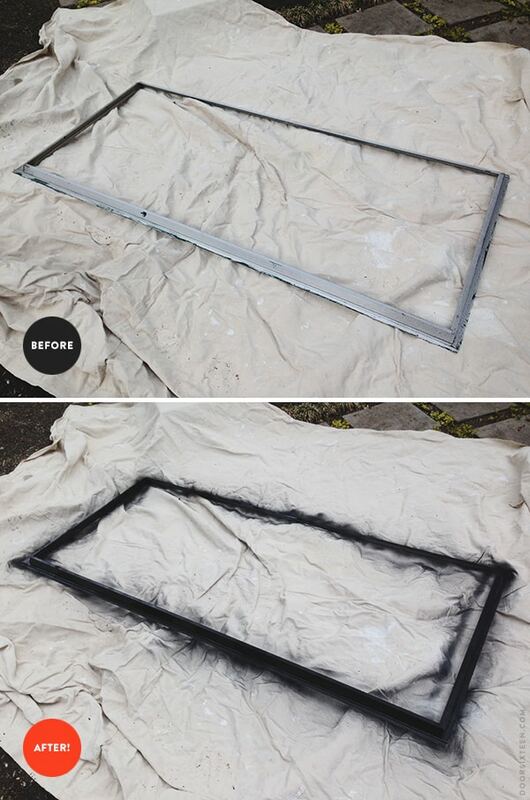 I rescreened a window years ago after having to break into my own house (woops). I was surprised at how easy it was! And it really made a huge difference because the window had an old gray screen like your old one. Switching to the black was like getting an HD view. So that is a storm window. That does look much nicer than before. But what does it actually DO? I always assumed those screens, you Americans have, were meant to protect against mosquitos and flies. Now you tell me it protects against the cold and the rain? But the effect can only be minimal, can’t it? Very puzzled about transcontinental habits. Can you explain further about those storm windows? Hi Florian, the screen insert is to keep insects out from getting in through any windows you might want to open during the summer. In the winter you take the screen out and put in a glass pane (you can see one of the glass pane inserts in the last photo—there’s a second one as well). When you have old single-glazed sash windows, the proper installation of a storm window makes them nearly as energy efficient as modern double-glazed windows. Aside from keeping the cold out and the heat in, they protect the window itself from the elements. Now I get it, thank you! posts about doing things you think are impossible — boldly going where no woman has gone before — are a subtle but enormous contribution to the mighty girl canon. thank you. don’t stop. love the pix of the spline roller. WHO KNEW???? Haha, I’m 100% positive I’m not the first person (of any gender) to paint a storm window, but I’m glad you find it encouraging! I’m so glad you posted about this! We’re in the exact same boat with our aluminum storms and have the exact same plan about spray painting the frames black. It wouldn’t have occurred to me to replace the mesh screens, but it does look so much better! Ours were so dirty and crappy looking that I took all of them out and put them in the basement, but now I feel compelled to fix them like this. Looks so nice! My heart stopped and my mouth is open. I had *no idea* I could paint the ugly aluminum storms! I’m in a 110-year-old house with original windows but ugly storms and the contrast makes me slightly bonkers. My mind is blown at this whole new world. And yes to new mesh! Thank you! Go, Marlena, go! Paint those storms!! Thank you, Anna, for deciding that now is the time to take on your windows! I have the same project lined up at my house, so I’ll be watching with great interest. Thank you for this information. I have a similar job ahead of me with my 90 year-old house. I had a feeling that I could fix the windows myself (or at least I wanted to believe that I could), but I didn’t know the terminology to use to search for instructions (it’s called a spline?). 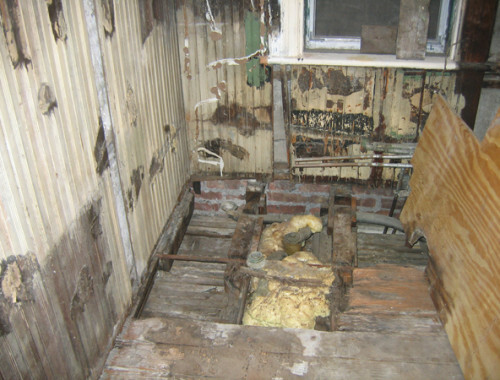 I really appreciate your posts on old home maintenance and repair. They’re great because 1) I like the idea and results of preservation rather than replacement, and 2) It’s very encouraging to hear someone else tell me that I can do the job myself. My home is about three times as old as I am, and I’m sure that it will be here long after I’m gone. I want to know that I’m taking good care of it while I serve as its temporary caregiver. Thanks again. Slightly random but your work on window screens reminded me of when I was little growing up just north of Toronto – we had a massive screen door for our sliding doors at the back of the house which we’d (obv) use during the summer to keep the bugs out etc. Our two cats however, did not approve of screen door. They picked a hole in the corner and before long, they were belting through their cat-made cat flap and would come and go as they please without the need of their human staff to open the screen door. My dad would then replace said screen, and the cycle started all over again. This may be a dumb question, but was that drainpipe on the left painted black?? Or maybe just replaced with a black one. I just noticed in your post about painting the basement window that it was silver before. 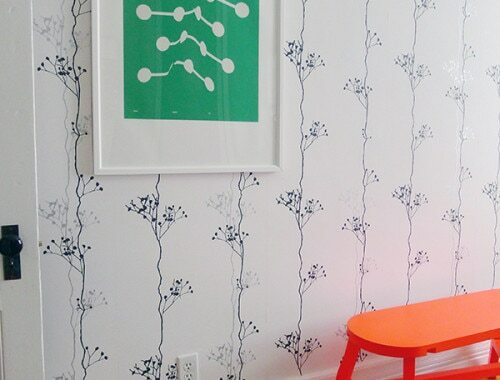 That’s really, really neat either way – it makes such a huge difference. Oh good grief… yes, the one on the right, sorry. I’m apparently brain dead today. But wow! That’s amazing. I’ve never seen that done before. It’s a really cool idea. This has given me hope. My house was “eisenhower-ed” at some point, [painted all white] and had aluminum storms put on. I have been researching authentic paint palettes and it seems almost all of them have dark window sashes – red or black or brown, and contrasting/lighter window trim. I think an additional problem I have, which you don’t, is that my aluminum storms are the overlay style, where it looks like your storm is inset/blind stop….therefore I lose the definition of sash area vs window trim. I have had the crazy idea of making wood storms, using my kreg jig and router [both tools I have owned a couple years now, but didn’t really use until I read where you and Daniel used them and became brave enough to try.] but that seems like a huge feat too. I have some of the old wood storm hardware still stuck on my house, with lots of years of paint slopped on them. Anyways…I’ll quit rambling 🙂 But this window thing gives me hope. I could paint my house so many cool ways if I could get around my window dilemma. Jenne, yeah, black window trim has a long history! I’ve been able to scrape down to the base layer of paint on my house, and it was definitely black originally—the sashes and the casing. Thanks for the screen tutorial!! My cats ripped several of my screen inserts to shreds and I had no idea how to fix them. They’re sitting sadly in the corner, waiting for me to google a tutorial (not my top priority). Now I see it’s fairly easy to do and I should just get it done already! How have we not met? I love your blog. Great work, too. Thanks for sharing. Been following your blog for a while now and thought now, after all that effort, might be a good time to introduce myself, say hi and keep up the good work! Unrelatedly, I thought you might be interested in this post (about book design). This is super exciting 😉 My back screen door is quite literally Magic Taped in several places. I don’t even know how it acquired so many holes, but alas. I thought having it replaced was beyond me, as I’d have to hire it out and I don’t have $$, but now I’m totally inspired to just take care of it myself. I had NO IDEA it was this easy. 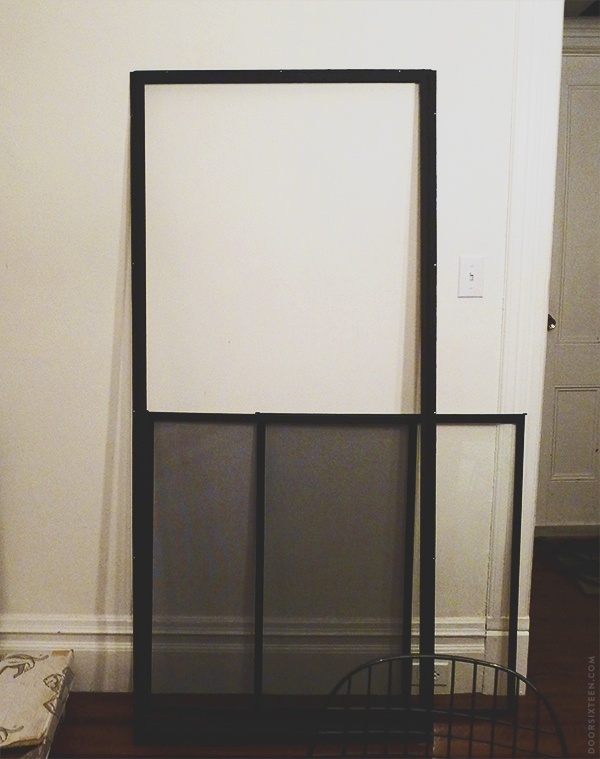 I hope the door screen assembles similar to your window screens. Totally going to check it out now. THANKS for the wisdom!! You have no idea how encouraging this is – like a bunch of other commenters, I’m in a 100-yr old building with original windows caked in years of sloppy paint jobs with aluminum storm windows tacked on the front. We have a great picture window in the back that even had its storm windows affixed on the inside of the house. After paying out the wazoo to get those old chain-and-pullies in the back restored, I think I might try to take on the others myself. Are you going to strip the sashes and refinish them when you tackle yours? This is inspiring. We have a 120 year old house that has the original doors and windows. We have a lot to do. This is inspiring. We have a 120 year old house that has the original doors and windows. We have a lot to do. Please PLEASE give us a post. I can’t read about artisanal ice cream sandwiches or curated air fresheners for one more minute! Yours is the voice I want to hear (read) every week or so. what a terrific makeover! Smart! re:galvanic corrosion, reducing this possibility just added years to your finish, nicely done! I’ve enjoyed your blog for a long time. Do hope you’re OK? A year or two ago, I replaced the screens in some of my old storms (after finding cats inside the house after I KNEW I had put them out) and found replacement screen at Home Depot made specifically for homes with pets. It is black, so it already looks better than the old screens and no holes in it, so far! Check it out; it might be a good option for other pet owners, too! Sorry. I found it at Menard’s, not H.D.! I would love to see how the windows look on the house! We just bought a house built in 1859 and it has a porch full of aluminum storm windows and we can’t replace them right away. Looking for alternatives. Btw…Love the house. Come check out our new “old” house on my blog. Great post- a little too cold to take ours down right now – but I see a nice spring project (we have a 1930 bungalow type house in Rhode Island with the aluminum storms. I have done rescreening before, but always with the metal screen – which can be a pain to work with – will try either fiberglass or the pet-specific one mentioned above when it gets warm again. 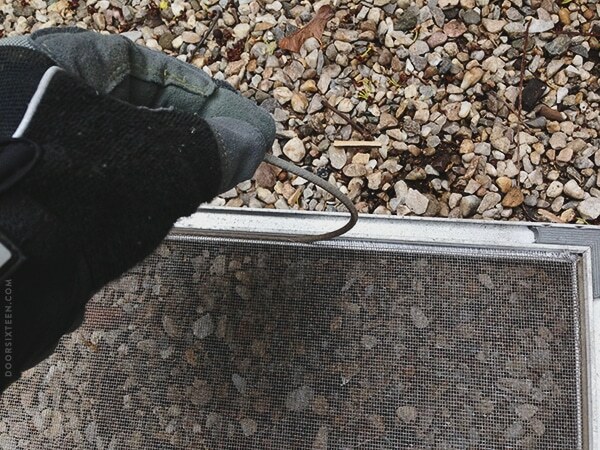 Now – anyone here by any chance figured out how to get a new aluminum sash made? (I’m missing one of the right sized sashes (for glass, not screen) for a triple track – much harder than I thought to get it replaced. Any chance you got a snap of these reinstalled before you moved out? 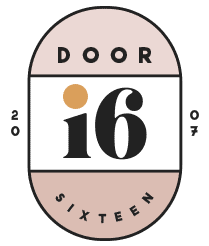 We’ve been talking about doing it on our 110 year old house, but I’m nervous to pull the trigger without a trusted testimonial (umm… what has the interwebz created in me? a co-dependant blog monster? ha!). Nope! Haven’t moved out yet, but I never reinstalled them. Thank you! I will check them out! Thanks for sharing your experience painting aluminium storm windows! I’d like to do the same with mine and this gave me some great tips. I’ll be sure to clean them with a scouring pad before painting them. Does the paint help prevent rust and corrosion? Okay, that’s it! I am officially chalk painting some ugly old wood furniture in my house! Thanks!